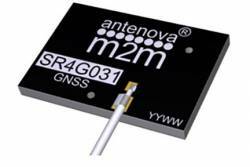 Antenova, manufacturer of antennas and RF antenna modules for M2M and the Internet of Things (IoT), has developed a new SMD positioning antenna designed to achieve an extraordinary level of accuracy in the GNSS bands; it can pinpoint a location to within centimeters, according to the company. Antenova Ltd, manufacturer of antennas and RF antenna modules, launched a new compact, all-in-one active GNSS antenna, part number M20047-1, at the CES show in Las Vegas last week. The product adds another option to the company’s existing range of positioning antennas and modules. Robusta part no. SR4G031, a new antenna for metal surfaces. Photo: Antenova Ltd.
Antenova Ltd, a manufacturer of antennas and RF antenna modules for M2M and the Internet of Things located in Hatfield, UK, has launched Robusta part no. SR4G031, a new antenna for metal surfaces. The antenna operates in the 1559-1609 MHz bands and is designed for tracking metal objects and smart city applications. Operating in the 1559 – 1609 MHz L-band range, Sinica is suitable for all GNSS positioning applications on the 1559-1609 MHz bands, including GPS, GLONASS, BeiDou and Galileo, according to the company.